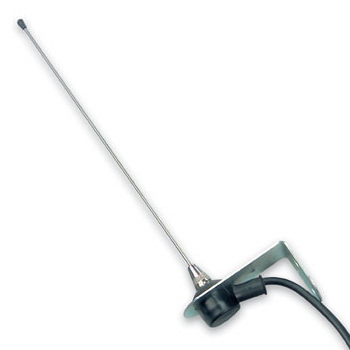 External antenna for improved range on 433 and 868 MHz radio systems. If you are having trouble with the radio control range on your electric gate installation you may want to consider adding and external antenna. Gate remote controls work by radio not infra-red but anything between the transmitter and the control panel receiver will limit the effective range. Many of our automatic gate kits come with and internal antenna that normally gives good range but the external antenna can be fixed above the fence or gatepost giving a better line of sight to the point from which you will operate the gates. In some very rare cases other radio interference can reduce the range on an electric gate or door radio control system and an external antenna may not help in such a case but it does let you locate the antenna in a slightly different position so may still worth trying. Supplied with coax cable for connection to most gate or door controllers allowing you to position the antenna for best reception and range.